Last month, Rachel and I were contemplating where we should go for our anniversary dinner. We wanted to stray away from something over the top expensive, but also find somewhere that was romantic and new to us. A few weeks earlier, we received Washingtonian’s 100 Very Best Restaurants issue, and there it was: L’Auberge Chez Francois. 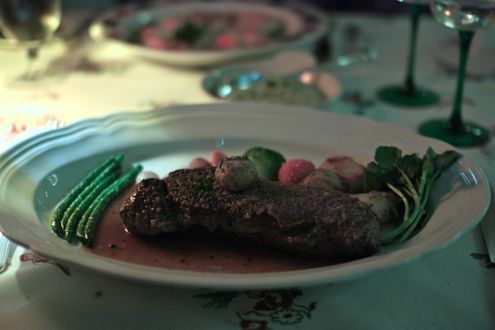 Originally located in downtown DC and opened in 1954, L’Auberge Chez Francois relocated to Great Falls, Virginia in 1975 and the rest, well, is history. Driving to the restaurant on the windy, mansion-lined Walker Road was a bit of an adventure as you’re trying to keep your eyes on the curvy road while trying not to gawk at all the over the top real estate. The exterior of the restaurant reminds you of a lovely French cottage, and it’s even homier once you step inside. In fact, L’Auberge Chez Francois is about as old school of a restaurant as you’ll ever find in the Washington metropolitan area. From the wood fireplaces to the wicker chairs, the atmosphere was cozy yet refined. It looks like time has stood still when surveying the interior of L’Auberge, but that’s not a bad thing at all. In fact, it’s a welcome departure from what we’re used to these days with dimly lit rooms and large white plates with small servings of food. 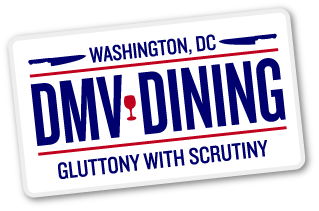 The four-course dinner is prix-fixe, with the price depending on which entrée you order, and they range from $68 to $81. While looking over the wine list, our waiter brought over a basket of warm toasted garlic bread accompanied with a cottage cheese spread. Naturally, we finished the basket in minutes. You wouldn’t think cottage cheese would complement the bread, but it helped balance out the strong garlic flavor. Shortly after, we received our amuse bouche: leek and potato soup presented in a tea cup. Nice touch, and the soup was delicious. As for our appetizers, I immediately decided upon the braised Wagyu beef cheeks. 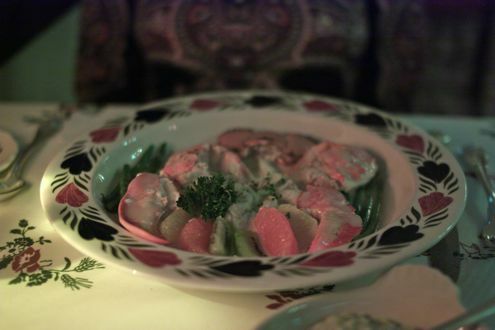 Accompanied with wild mushrooms, vegetables, and a sherry wine sauce, this dish was exceptional. 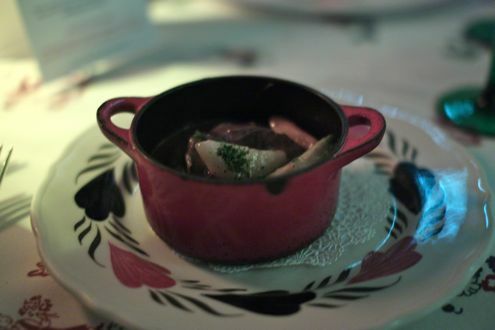 Presented in a Le Creuset pot, the beef cheeks practically melted in your mouth. Considering that this was only our first course, the bar was certainly raised high after enjoying this phenomenal appetizer. Rachel ultimately decided on a crêpe with chives, stuffed with a duxelle of mushrooms, tomato concassé, with a truffle sauce. 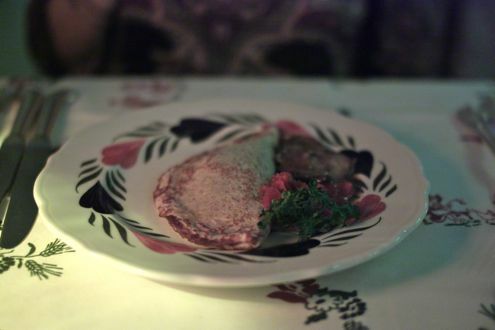 While a crepe may not seem as indulgent or over-the-top as wagyu beef, it was definitely the best crepe she’s ever had. Every bite was perfect and she only wished there was more than one on the plate. Following the appetizer course, L’Auberge Chez Francois provides their organic mesclun salad with vinaigrette. You can, however, opt for one of their special salads for an upcharge (approximately seven dollars), but we passed. If our first course was any indication, we knew we were going to be in for a filling meal. After the salad course, we were served a grapefruit sorbet intermezzo. I distinctly remember the sorbet having a strong, pungent flavor. And that brings us to our main course. Keeping with the beef theme, I opted for the peppered certified Angus Beef sirloin. Diners have their choice of having it topped with Roquefort cheese or shallots, and I went with the latter. Cooked medium rare and wonderfully tender, the steak was an incredibly generous portion. So large, in fact, that I couldn’t even finish it. That, my friends, is a rarity for someone like me. For Rachel, there was no indecisiveness here. As soon as she saw the words “whole Maine lobster”, that was instantly her choice. Her dish was a poached Maine lobster, along with jumbo lump crabmeat, Sauternes butter sauce, and citrus pieces. It felt so gluttonous eating a completely declawed lobster in a rich sauce. The only small complaint would be there could have been a little less sauce so it wasn’t as heavy, or maybe she should have asked for it on the side. Nevertheless, she was in heaven. 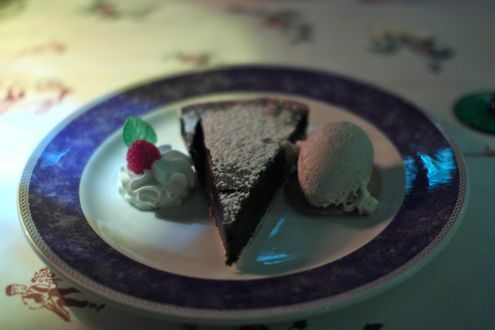 For dessert, I went with the chocolate tart with vanilla ice cream. Incredibly rich, this was a surefire choice, though Rachel’s dessert still managed to trump it. And that brings us to the chocolate soufflé. Should you ever dine at L’Auberge Chez Francois, do yourself a favor and spring the extra $8.50 for this. Saying it is well worth it would be an understatement. In fact, you have to order it when you order your entrée because of the preparation time. You have the option of ordering the chocolate, hazelnut, raspberry, or Grand Marnier. 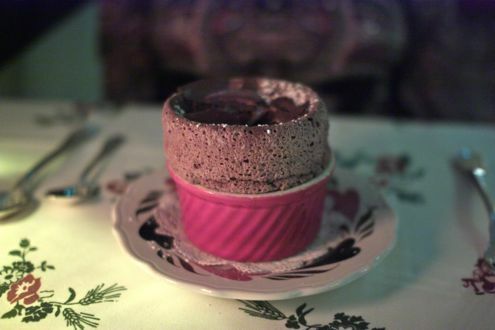 She had to go with the classic chocolate soufflé, and it was definitely worth the upcharge. She only wishes she weren’t too full and was able to finish it all. And on top of that, the kitchen treated us to a complimentary anniversary gift – a soft caramelized meringue with kirsch and vanilla ice cream! Very nice gesture by Chez Francois, yet we were so stuffed that we could barely finish it. As for the service, it was impeccable. Remember, you’re dining at a high-class French establishment, and our waiter was incredibly helpful given our trademark indecisiveness. We’re so glad that we ventured out to Great Falls to experience L’Auberge Chez Francois for the very first time. While the food isn’t as adventurous as, say, the newest restaurant on 14th Street, the execution was outstanding while the romantic atmosphere made for simply a wonderful anniversary destination.